Once the BoldGrid Inspirations plugin is installed on your WordPress website, you can get started by installing your first BoldGrid Inspiration! 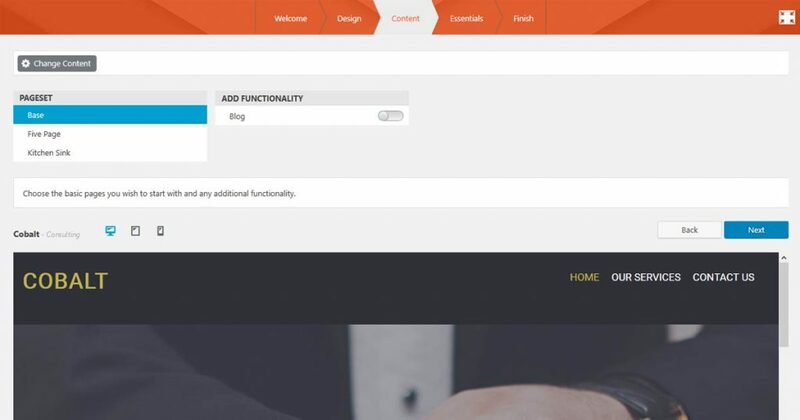 This is the first step in your journey of building the custom website you want. The following article will walk you through the steps of creating your first BoldGrid Inspiration. 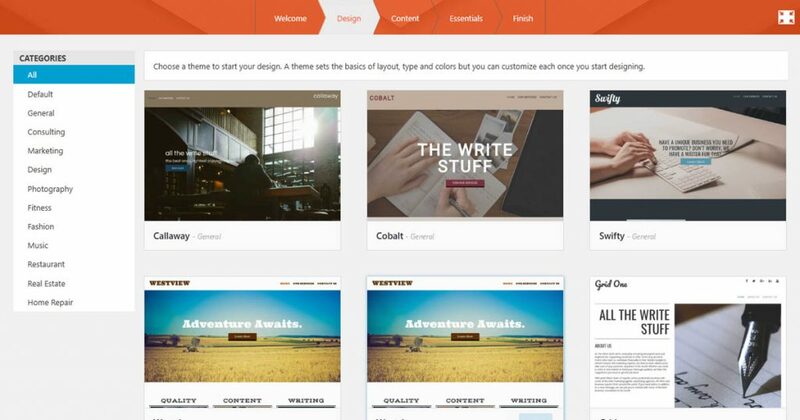 If you have existing content on your website, Inspirations will make some changes if you proceed. Any existing pages and posts will be put in the “Trash” which is easily recoverable later. 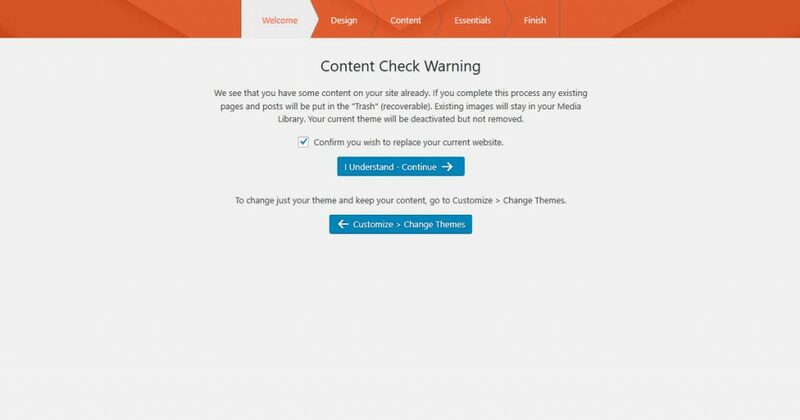 Existing images will stay in your Media Library, and your current theme will be deactivated, but it will not be removed. If you have important stuff on your site, you may want to take a backup to ensure peace of mind. When you are ready to continue, Select the blue button labeled I understand, Let’s Continue → to move on to choosing your industry and theme. Selecting Change Content at the top of the page will provide you with options for your pre-installed content set. Control the number of pages included: 3, 5 or the kitchen sink! 5 will install two additional pages, specific to the category you chose. “Kitchen Sink” will install all of the available pages for your category. 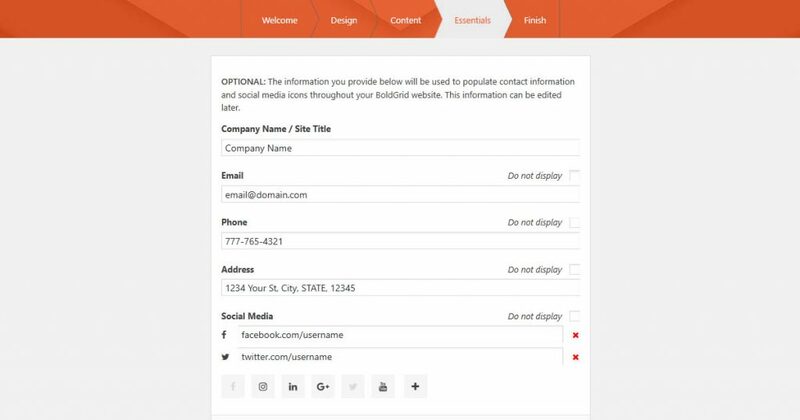 The information you provide here will be used to populate contact information and social media icons throughout your BoldGrid website. This information can be edited in the Customizer, so feel free to decide at a later time. Congratulations, You have installed your first BoldGrid Inspiration! Next, you can Customize your BoldGrid website.